The Daily Camera is featuring a tale of Boulderites making an unusual effort to construct their dream home in Fourmile canyon. When I visited Germany a few years ago, the quality of construction was plainly evident. Every building had solidity that stunned. Even windows, doors, and fixtures were of extremely high quality. When Germans build a home, they clearly build it to last. And now YOU can order yourself a German Chalet right from the factory. 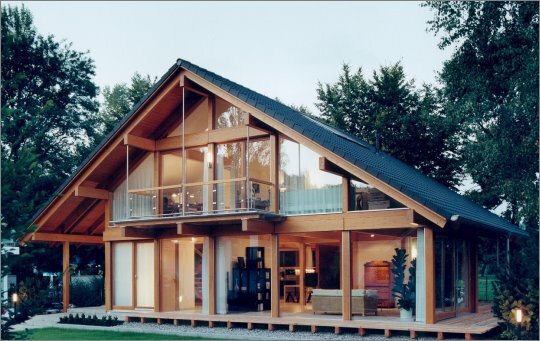 In the passionate pursuit of their dream and knowing Germany's near obsession with building quality, Ralph Meier and Maryanne Bruno placed an order with Platz Haus, a German company putting an entirely new spin on prefabricated construction. Although the article says there were many difficulties, it sure sounded like smooth sailing to me. Especially compared with the alternative. The home was shipped from Germany a week after the couple got their building permits, arriving on-site only five weeks later. Under the watchful eye of two German specialists the home is being put together quickly. The walls, roof, and windows were in two weeks later and the adventurous couple plan to move in by March or April. Including shipping, the costs are estimated at about $200 to $250/SQFT or about 1.0 to 1.35 million. Frankly that's not bad for having exactly what you want in about four months. In some cases, unique luxury home projects take two years (or more) to complete and cost substantially more. For some, the absence of hassles with the architect and builder alone might be worth it. Last night Ray Tuomey of Namaste Solar joined us for dinner. He stunned us with the news that Namaste, a recent startup, is more than doubling in size on new residential and commercial solar electric orders. Given the increasing interest for all things ecologically and energy efficient, we predict this won't be the last Platz house in Colorado. Hey Ralf and Maryanne - can we get a tour?